I founded the Tabloid Witch Awards horror film festival in 2004. In 2005 I introduced a "Best Sound" Award. This is because sound is an often under appreciated element in filmmaking, so I wanted to highlight those films that put sound to good aesthetic use. Since then, I've payed close attention to the entry films' soundtracks (sound effects and music), trying to discern which films did it best. Yewdall's book will help me in this endeavor -- it's not just for filmmakers, but for anyone seeking a better understanding of film sound, including festival judges and film critics. 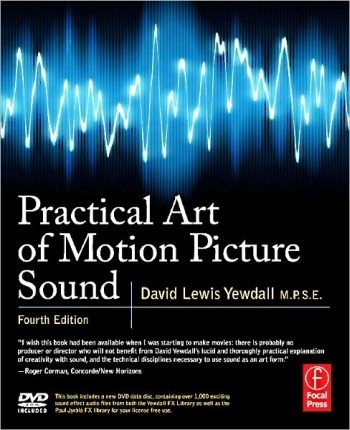 This is the most complete book on motion picture sound that I've come across. Printed on heavy, high-quality paper, the book covers sound from every angle, though as the title implies, the book's emphasis is on the practical -- full of tips and instruction on creating, recording, mixing, and editing sound for your projects. Yes, sound has to be created. There's much info here about sound recording on location -- how to choose a microphone and recorder, where to put the mic or mics. But there's also info about Foley artists; the people who create sounds in a studio -- from the fantastical or difficult (e.g., alien noises, explosions, crashes), to the deceptively simple (e.g., the many types of footsteps, depending on whether characters are running or walking or sneaking along, on grass, carpet, stone, whatever). Yewdall's book discusses how microphones work (with diagrams) and reviews four portable digital sound recorders (with illustrations on what buttons do what, much like a "how to" manual). Another chapter discusses what he calls "The Venerable Nagra IV-S," an analog recorder. Back when I went to NYU film school, before the digital era, sound recording meant using a Nagra. It was the industry standard, and apparently, there are still many recordists out there who prefer it to digital. It's hard to think of a sound topic not covered in this book. We learn about sound librarians; how music editors collaborate with music soundtrack composers; sound restoration (cleaning up the soundtracks to decades-old films); and creating and editing sound for the growing video gaming industry. And about jobs outsourcing. Some film workers may not like this, but technology is shipping jobs overseas. American film and video game producers are sending their digital images and soundtracks to post-production houses in India (via broadband internet), which send back the work product (via broadband internet) the next day. Yewdall says. "Outsourcing to Canada was yesterday; today it's India and China." As he explains the process, "India is 12 1/2 hours ahead of us. We receive color data from India every morning that are applied to our high-definition frames here in San Diego. We ... send QC notes for fixes, which follow the next day." In the new global economy, it's not where you are, it's what you know. But the good news is, you'll know a lot more after reading this book. This book has 657 pages, and the text is fairly dense, so it's heavy reading. But it's also generously illustrated with diagrams and photos (of equipment, cue sheets, computer screen shots, etc. ), and the writing style is breezy. It reads easily, even if there's much information to digest. I wish Yewdall had reviewed all the major sound editing computer programs, including the smaller ones for hobbyists, and explained how each works. Of course, there are manuals for such programs, and one can't expect a broad overview of sound (such as this book) to offer detailed instructions for every sound program. Yewdall does occasionally touch on Pro Tools (a computer program), and gives some explanatory screen shots of the program. So this book helps in learning Pro Tools. But it's only a taste, rather than a Pro Tools manual. That's not to take away from the book. It's a great, easy-to-read book covering just about everything you want to know about film (and video game) sound. Yewdall is an experienced soundman (with some 140 feature films to his credit), holding many jobs over the decades, including sound editor. (He's a member of the Motion Picture Sound Editor's Society). His book talks a bit about the history of film sound, and a lot about his own work experiences. Apart from his own anecdotes, working with famous directors and producers (yes, he name drops, but that just makes his book more interesting), Yewdall has interviewed his colleagues for this book. So his book offers insights from many perspectives. Included is a DVD with "over 1000 sound effects from the author's personal library," which you can use in your own projects.